My dream home has a fully automated aquaponics system that grows tilapia and vegetables in the backyard. 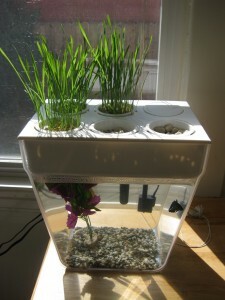 Alas, I live in a tiny apartment in San Francisco, so the closest I can get to experimenting with food self-sufficiency is this Back to the Roots Water Garden. Fish eat food and excrete ammonia. Bacteria convert the ammonia to nitrites and nitrates. Plants are fertilized by the nitrates and clean the water for the fish. 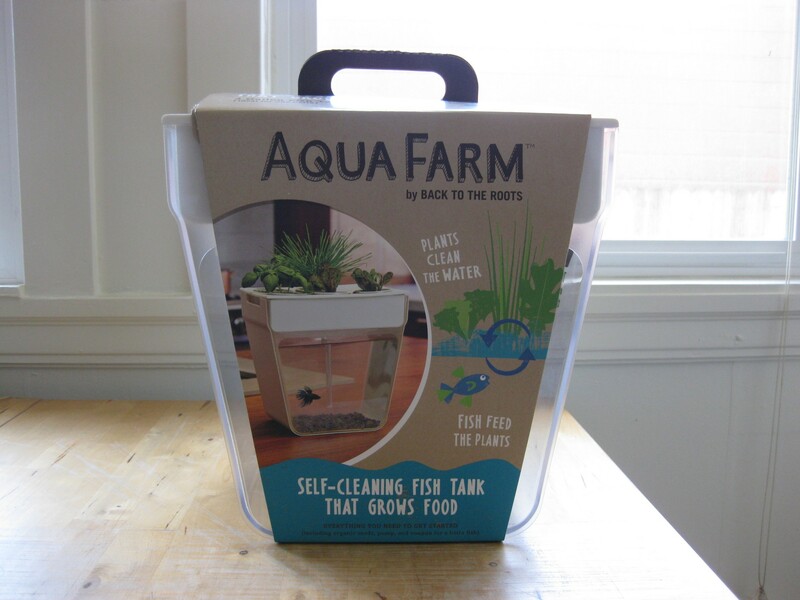 I had hoped the Back to the Roots aquarium would be a good way to experiment with aquaponics on a small scale and grow fresh herbs for the kitchen. It comes with everything you need to get started: a 3 gallon fish tank, gravel for the bottom of the tank, a water bed with pots and growstones for the plants/herbs, a pump to circulate the water from the tank into the water bed, nitrifying bacteria, and fish food. The tank is too small to support edible fish, so it’s powered by a betta fish (the kit includes a coupon for a $1 betta fish at Petco). Meet my betta fish, Tony Jaa! It can purportedly grow many different types of herbs. I tried growing wheatgrass, basil, and cilantro from seed, but I was only able to successfully grow the wheatgrass. The basil and cilantro sprouted, but the plants never grew. Based on my experience, I would not recommend it as a way to grow herbs for the kitchen. However, it was a fun experiment and makes for a nice betta tank. Tony Jaa happily made his bubble nests in the clean water.